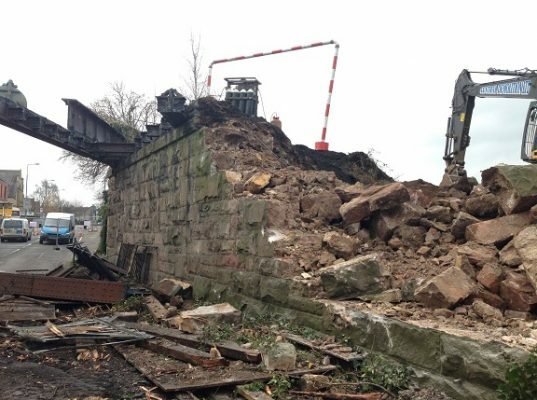 Central Demolition Limited were awarded the contract for the demolition of Tummel Way Footbridge & Rotunda. The footbridge spanned Central Way in Cumbernauld’s busy town centre. It was originally planned that the demolition of the footbridge would take place in October 2011, but works had to be rescheduled after the bridge was found to be heavier than originally thought – it weighed several tonnes more than anticipated and the concrete decking was far thicker than expected. The works were subsequently postponed until January 2012 so as to avoid disruption during the busy Christmas shopping period. Nicknamed “bridge to nowhere”, the long disused footbridge was not a great representation of Cumbernauld. Out of action for several years prior to demolition, locals and visitors were often forced to take a 5-10 minute detour to travel around Cumbernauld town centre on foot. Much to the delight of many, Tummel Way Footbridge was replaced with a new £1 million footbridge after the demolition was complete. A lot of preparatory work was required as part of this project. These works included the removal of the roof and the glass windows – for safety and also to reduce the weight of structure to be lifted. Plywood protection was erected to walls at the Mall corner to prevent structural damage. Test holes were drilled into the deck to gauge the depth, and later the deck of the footbridge was broken out in sections. With it transpiring further to investigation that the footbridge deck was not as designed, proposals and plans had to significantly redesigned, taking into consideration the heavier weight than anticipated. These were just some of the comprehensive preparations undertaken. Following preparatory work, the footbridge was finally brought to the ground. The works were scheduled to take place on 21st January 2012, however the footbridge removal was delayed until 28th January 2012 after strong winds were forecast. When the day finally came for the footbridge removal, a fourteen hour removal operation commenced. Overnight road closures and diversions were enforced to protect the public and to facilitate the works being undertaken. 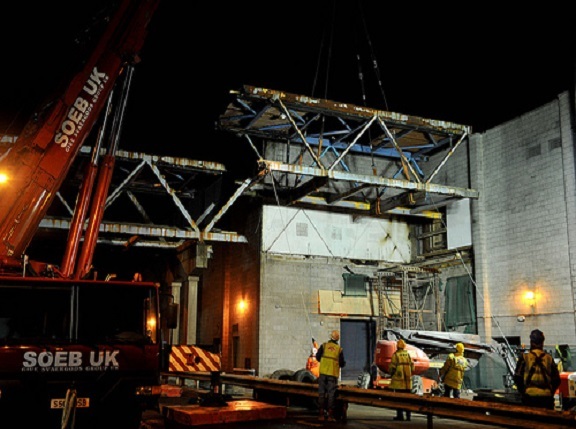 On the night, 30 workers, specialist equipment, a crane and a tow truck were all brought onto site. 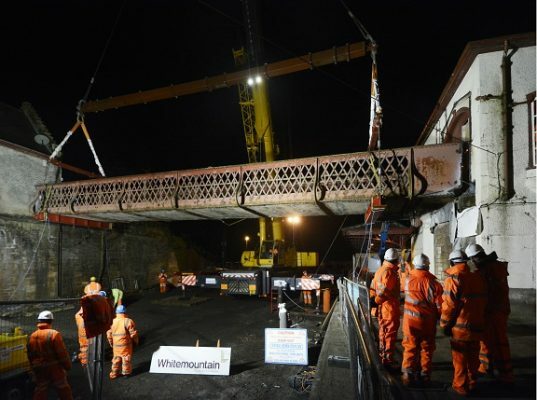 In accordance with the comprehensive lifting plan, the bridge was lifted in 2 sections. 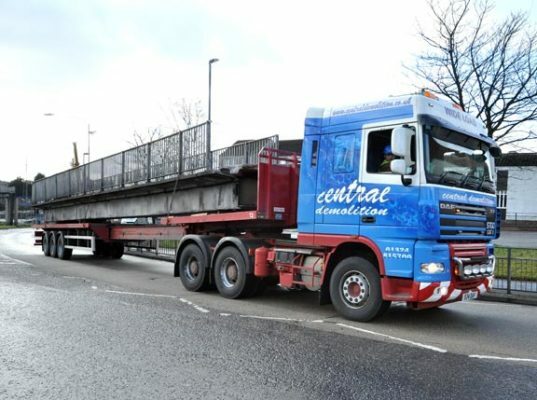 The first section (15m length; 15 tonne weight) was carefully lifted and loaded onto the back of a heavy tow truck and trailer. Hours later, and on schedule, the second – larger – section was removed. Being 25m in length and weighing 77 tonne, lifting this section was certainly more challenging – but the lift was completed successfully. This project was definitely challenging throughout, but our team worked hard and overcame all obstacles. Our men had to work lots of overtime as over and above our normal weekday working hours, several nightshifts and weekend shifts were required. The extra shifts were mainly arranged so as to minimise the disruption caused to the public due to the central location of the works e.g. road closures were required for sections of the work. Our team were also under pressure as there was extensive media coverage of the project – which opened us up to public scrutiny. However, our men took the attention in their stride and worked safely and with great skill and precision. Overall, this was a very successful project. Despite the aforementioned delays caused by circumstances out-with our control, we completed the project within the timescale promised. 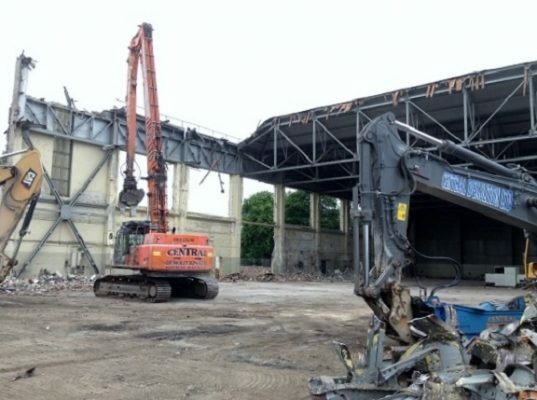 The complexities of the works posed both risks and challenges, however all challenges were addressed and the project was completed safely with no incidents occurring. Morgan Sindall were delighted with our level of professionalism and with the skilled and experienced team we provided.